Some people spend as much money on a kitchen as they do a car, yet expect to do no maintenance. Would you be surprised if your truck engine overheated if you never changed the oil or refilled the coolant? Most also expect to rotate and replace tires and wiper blades. A small amount of condensation on the fridge or freezer is normal, especially during humid weather and summer vacation, if you have kids who don’t know how to keep the refrigerator doors shut. If you see more condensation than normal, check the seal (or gasket as we appliance nerds call it) for any obstructions and clear them. If there aren’t any, try moistening the gasket with Vaseline. Seriously, it works. If you don’t have any petroleum jelly, I’ve used Neosporin in a pinch (What won’t that stuff do, honestly?). After applying a thin layer of Vaseline, organize your fridge. It doesn’t have anything to do with the seal, per se, but it will help you find what you need faster, meaning the door won’t be open as long. If Warners’ Stellian installed your fridge, we leveled it to tilt slightly back to encourage the doors to swing shut. If someone else installed your fridge, consider leveling it in a similar way. To raise the front of the cabinet, use the front roller leveling screws. 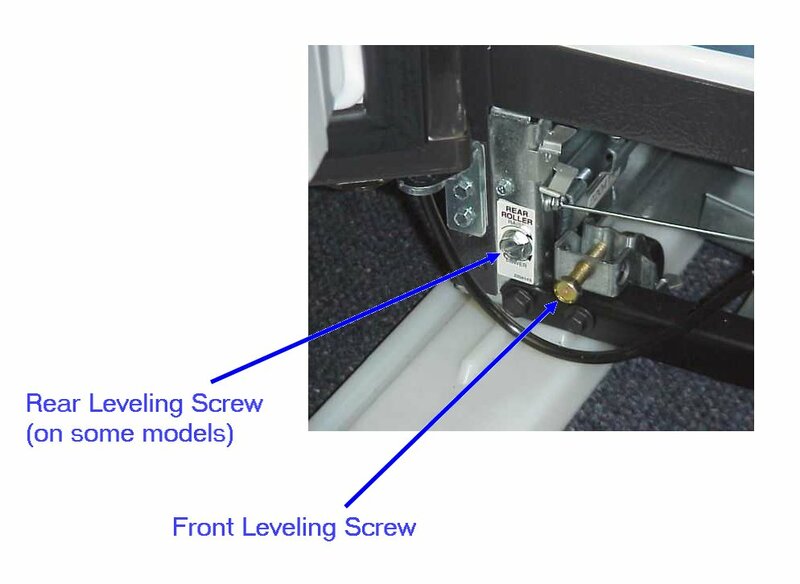 To lower the back of the cabinet, use the rear roller leveling screws, if available, on your model. New refrigerators have self-cleaning condensers. But if you have an old fridge, you might still have coils that need to be cleaned once or twice a year. Some fancy vacuum cleaners have attachments to suit this purpose. But otherwise, you’ll have to get a coil brush from an appliance parts store. To clean the coils, remove the base grille and use the brush or vacuum attachment to clean it, the open areas behind the grille, and the front surface area of the condenser. If you have pets or hairy, shedding family members, take care that the area around the refrigerator stays clear to ensure proper heat exhaust. Otherwise, that thing will be running all the time. If you have a water dispenser, you likely have a water filter. Replace it every six months or take direction from your indicator light, if you have one. Or, if odor and odd taste don’t cramp your style, stretch the life of it. But seriously, beyond water quality, an old water filter can cause sediment to build up and cause problems. There are probably seven different types of water filters. Yours is either is the top back corner of the interior, down in the kick plate, or along the top interior of the fridge. ALWAYS bring your filter into the store when you’re replacing it because we don’t necessarily know the type a filter goes with a model number we looked up in your order from two years ago. We can guess, but it’s still a guess. After replacing the filter, flush the air from the water system (see how to purge air from the water system animation – though 4 gallons seems like overkill) to prevent dripping from the dispenser. Your freezer is probably “frost-free,” meaning it defrosts itself. You may have purchased an all-freezer unit that is manual defrost for storing foods long-term, but that’s another blog post (or e-mail me). Just take care to clean your fridge and freezer every month. Your turn: What did I miss? Gaskets on a fridge shouldn’t ever require “moistening”, but if you feel something is needed, might I suggest the same product one would use on your vehicle’s door gaskets and rubber tires — Armor All! Only thing is is to make sure the door gasket is clean of food and gunk prior to using otherwise it will “seal” it on. Also for leveling a fridge and as a part of new installations, I always leveled them so that when the door is opened to 45 degrees, it would close on its own. Hope this helps some! Thanks for the suggestion. Armor All, huh? Have you ever tried it? I’ll have to remember that one. I don’t know why the gaskets wouldn’t require moistening; why, I fixed a bad seal last spring with some Vaseline myself! My roommate thought she’d need to call in service. Thanks for sharing your maintenance experience. From the looks of your blog, I’m sure you have a lot more where that came from! No reason it shouldn’t work, but personally I like a silicone spray lubricant. It keeps the gasket flexible and from sticking and it won’t evaporate like the petroleum-based product will. And it won’t get on your arm, clothes and so on when you use the fridge. Use these measures as a temporary/last resort as normally a thorough cleaning is all that is required to keep it operating properly. How do you tell when your gasket is bad? Using a dollar bill, insert it between the fridge and the gasket as you close the door. Now pull slowly on it, it should be held firmly by the seal of the magnetic gasket. If not, replace the gasket. These can be purchased through any appliance repair shop. Be sure to take your fridge’s brand name, model number and serial number with you when you go. Gee, I have had the same refrigerator for 25 years, never did a thing to it and never had a problem. I made sure to leave plenty of air space around the coils. The coils are about 3 inches from the wall and are exposed to free air flow on one side and the top. I do vacume the coils if I happen to notice much dust on them. They made fridges differently 25 years ago, so I’m not surprised yours in still running. That’s lucky for you (though not for your energy bill, I’m sure…). It is important to keep coils clean, at minimum. Thanks for your comment, Frank! Very good article. I have worked in professional kitchens for over 30 yrs, and keeping the coils clean is the single most important “must do” in keeping a refrigerator/freezer working properly. If you have an ice maker empty ice completely once every 3 months and your ice will stay fresh. Never store in a garage or on a back porch unless the unit is designed for that use. Good tips on the ice maker. I have to say, it’s not advised, but my family kept our freezer in the garage for years. Or should I say freezerS. Maybe we shouldn’t have, ha. Keeping the coils cleaned is SO important because dirty coils work harder and cost you more money! If you don’t feel like making the investment in a coil brush (they aren’t expensive) you can always use a broom to remove the built up dust from the coils every three months. If you have pets, do it more often (every month or two). Is it OK to use an indoor refrigerator/freezer on a porch or in a garage? If not, why? Manufacturer warranty on refrigerator/freezers will be void if the unit is placed in an area (garage or porch) where the temperature goes below 50 degrees. The reason for this is because in such a cold environment, the coolant in the refrigerator could freeze up, causing the compressor to overheat and fail. If you are using a heated porch/ garage or if you live in an area where the weather does not reach below 50 degrees, then it would be fine. Otherwise, it is not advisable. Condenser coils on refrigeration – make sure it always clean – othewise compressor getting overheated and broken, some models has quik access for check up condenser coils some pnes not.